Big Bertha, the Magic Music Bus, is taking another road trip. She'll be hitting the road in 2019 and we'll have more details soon. The tour will once again feature instrument drives, school visits, instrument deliveries, and the general spreading of Hungry for Music love across the country. There are lots of miles to cover and Bertha gets mighty hungry. Can you help us keep her tank full? Please pitch in if you can! 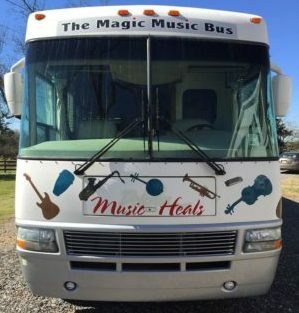 Support the Magic Music Bus Tour - 100 Cities in 48 States. Trip details will be posted here soon. We'll also add updates on the Hungry for Music Facebook page.